We’ve just finished a fantastic Spring Break at the Children’s Museum of Houston! On the first Sunday (March 14th), we celebrated Pi Day (3.14 = 3/14 = March 14th). 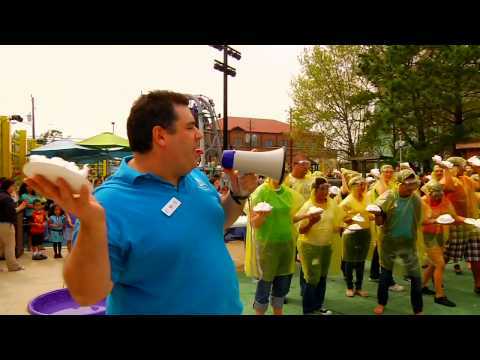 And what better way than with the First Annual Children’s Museum of Houston Pi Day Pie Fight! We had 46 volunteers willing to throw pies and be pied from all walks of life – doctors, scientists, engineers, college students, and teachers all joined in the chaos! What is Pi Day? Well, it is a day when we celebrate all things Pi. Pi is the ratio between the radius of the circle and its circumference. In other words, if you measure from the center of the circle to the outside (aka the radius), then compare it to the distance around the circle (aka the circumference), you’d find the circumference is a little more than 3 times the length of the radius. ALWAYS. No matter how large or small the circle, it remains constant. It also is irrational which, in mathematical terms, means it goes on FOREVER. 3.14159 is only the beginning – it keeps going with no discernable pattern. So why is Pi important? Well, it is essential when dealing with anything involving circles, including anything spherical or cylindrical (ex. balls, pipes, wheels, gears, pulleys, cams, axles, etc.). Pi also routinely appears in mathematical equations describing the fundamental principles of the universe (ex. Coulomb’s Law for Elastic Force, Heisenberg’s Uncertainty Principle, Einstein’s Field Equation for General Relativity) and in probability and statistics.